My story begins around 1975. My aunt Tootie lived in Gretna, Louisiana. She became very ill after having a baby. Once she was admitted into a hospital, it was determined that she was suffering from degenerative cardiomyopathy. My aunt died. In 1989, my brother, David, started having heart issues. At first it was thought that a virus attacked his heart and severely damaged it. Later it was discovered that his heart problem waa also degenerative cardiomyopathy. My brother’s health plummeted. He was placed on tbe heart transplant list. In 1990, he received his greatest gift. During 1990, my sister started having some discomfort in her chest sought medical treatment. She was diagnosed with degenerative cardiomyopathy. A friend of my sister was working for a Doctor who had just received a grant to study family heart issued invited the rest of our families to participate in a study. It was discovered that I was the only other family with degenerative cardiomyopathy. I continued to seek treatment over the next 13 years and then moved from the Houston area. In 2000, my brother passed away. I watched him throughout his process and saw him have a difficult time. While watching him, I always said that I wouldn’t go through a transplant. He was not the example on how to live with a transplant. In 2003, I moved from the Houston area pursuing a Chief of Police job, near Lubbock, Texas. I continued working as Chief of Police in a couple of other small Texas towns taking a job in Mathis, Texas in 2010. Five months later I was also working as City Manager in Mathis. My job was very challenging and I thrived. In 2012 I started noticing shortness of breath, and tried to fix myself. Weight gain and a lack of exercise was my problem so I started working on both. I found myself too weak. I continued to work and progressively worsened. Finally in October of 2012 I went to the emergency room and was admitted to the hospital. The following day I was transferred to St. Luke’s Hospital in Houston. November 1st I was fitted with an LVAD and when being released from the hospital went back home and then to work. I worked for the next six months before retiring in May of 2013. I completed all my honey-do’s and had nothing to do. I worked out everyday while still wearing my LVAD. Then I became very bored. I looked at a web-site and located a job back in Galveston County where I was raised. I started preparing my resume when my phone rang and I was told that I was on the transplant list and I needed to get closer to Houston. I moved into my mother in law’s house. Six days later I received the call. I received my gift on August 2, 2013. Once in ICU, with the help of my father driving all over the Houston area, I was able to complete my resume and we mailed it from St. Luke’s Hospital. I was released from the hospital on Aug 19th, interviewed on Sept 14, and returned to work on September 30, 2013 to my new job as Chief of Police in Bayou Vista, Texas. Seven months after my transplant my wife and I rode in the MS150 telling everyone about my transplant and promoting organ donation. 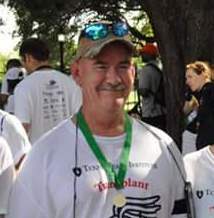 I also participated in the 2014 Transplant Games in Houston. My wife and are still promoting donation and I will be not only a participant in the Transplant Games, but a competitor. In closing, I will be renting a van to travel to the games this year. I have agreed to take a couple of competitors and a couple of other competitor’s bicycles. I appreciate the thought and your decision on this matter. 17 de April de 2017 a las 07:06 07Mon, 17 Apr 2017 07:06:26 +000026.